Have a Hunger for More Racquetball Information? The New Racquetball Website Will Help Feed Your Passion. For several years our racquetball organization has been implementing new ways to tap into the power of the internet so players, directors, and fans easily obtain timely and accurate information about racquetball tournament information and results. 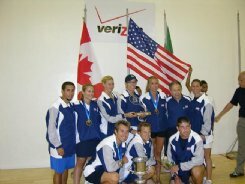 We are proud to announce the release of the new, all-inclusive USA Racquetball Tournament Web Site and the official national tournament home page of USA Racquetball: www.USAracquetballEvents.com Now there is a central location for racquetball players, event directors, media, parents, fans, and state directors to get racquetball tournament information. This system works off the R2sports Virtural Tournament Bracket Pro software customized for USA Racquetball. Tournament Info: Outdoor racquetball season is in full swing!! CASH prizes in all events (amount TBD by participation), longwall and one wall events, junior division, Saturday and Sunday breakfast, Saturday afternoon cookout, drinks and snacks provided.